Kidz ‘n’ Cats dolls are a very popular range of children’s play dolls designed by Sonja Hartmann, the founder of With Heart & Soul based in Germany. Sonja is a respected doll artist who sculpts the faces and designs the dolls outfit and it is her skill that makes the dolls so very special. 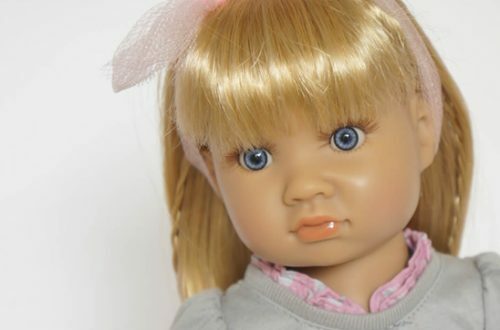 Since their launch in 2009, although designed for children, Kidz ‘n’ Cats dolls have also become highly sought after by collectors with retired dolls beginning to fetch high prices. 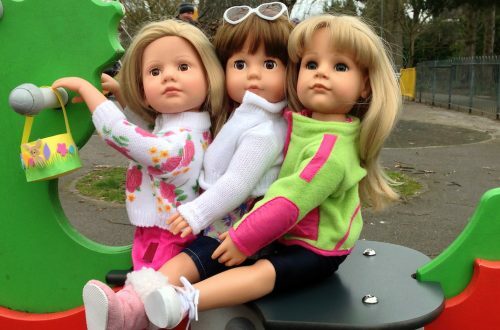 The dolls are 46cm tall and are made using high quality phthalate free vinyl. They have 11 joints in total including in their elbows, wrists and knees. The joints give the dolls a relaxed and natural appearance as well as making them great fun to pose. Kidz ‘n’ Cats dolls have hair made from kanekalon with all the strands knotted onto a mesh wig which is securely attached to the head. To keep the hair in good condition it is recommended that only wire hair brushes are used and a small amount of hair cream is brushed through every few weeks. The eyes of Kidz ‘n’ Cats dolls are made from unbreakable acrylic glass with lots of detail and sparkle. As they are fxed in position, the eyes do not close and have long eyelashes attached to the top lid with lashes painted on the lower eyelid. Their lips, eye brows and cheeks are all carefully painted. I think pictured above is the very first Kidz ‘n’ Cats Princess in Pink – no joints are visible in her wrists. I think she was launched for Christmas 2009, which was their original launch year. She also has a fringe without little plaits on each side of her face (all recent dolls with fringes have plaits for some reason) compared to later models of Princess in Pink which have no fringe. She’s beautiful and I’m pleased I took a photo for one of our Christmas promotions. Another original doll from the first ever collection is pictured at the top of the page. I do so wish I had kept one of these girls. Called Helen, this doll had the palest blonde hair and blue eyes, with my favourite face of all time. Stunning. Kidz ‘n’ Cats clothing is also very special, firstly because of Sonja’s detailed designs which are based on fashionable clothes that real little girls would want to wear themselves, but also because pieces are made using zips, buttons and button holes, hooks and eyes with very little velcro being used. Coats are lined, pockets and bags open so that things can be put inside. Because the dolls have joints in the elbows, wrists and knees, giving added flexibility, it means that the clothes can also be quite fitted. All the dolls and accessories comply with European and American toy safety standards EN71 and ASTM F963 respectively. The dolls are assembled in Germany under the watchful eyes of the Hartmann family, thereby ensuring their high quality. Kidz ‘n’ Cats recommend their dolls for children from age 6 due to the fitted clothing and multiple joints, both of which require a certain amount of manual dexterity to cope with. Up to and including the 2015 collection the dolls were beautifully made but unfortunately the 2017 and 2018 collections have had many problems. In 2016 the new collection arrived and the skin tone was stunning and the face painting really beautiful, but sadly the wigs were mostly below standard. And in 2017 the new dolls arrived and this time the appearance of the dolls had changed drastically because of the production process. We aren’t certain what is going to happen to the brand in the future because no new collection was launched in 2018, probably due to the company needing to sort out the production issues. We hope that the situation will be resolved because we believe these beautiful dolls, thanks to Sonya’s skills, still have the potential to be incredibly popular around the world with both children and collectors. The best range at the moment can be found with our friends at Un Bonheur de Colibri in France. You can order by email and ask them to check the dolls for you too. UK and international shipping is available and don’t forget to mention Petalina to claim your free gift when you spend over 90 euros. You can also find Kidz n Cats dolls and dolls clothes on Amazon. Hello Isabel, thank you for your message. Kidz ‘n’ Cats do have clothes available and some cats, it’s just a matter of finding them at the moment. KR Bears and Dolls have a good selection of clothes and also they have the cats! Un Bonheur de Colibri in France also have an excellent selection of clothes. I hope you manage to find what you are looking for, and please mention Petalina if you get in touch with them. Thanks!